Some love stories are just too far-reaching to keep to yourself. Life appears to be a great mystery, but at its core, it is the greatest love story. ‘Conduit’ is a soul-to-soul love story that transcends physical life. "Some books come along meant to be perfectly honest, and to deliver a profound message to everyone. Jonni Gray's Conduit is such a book. It is a reassuring message about surviving the loss of a child. But it's more than that. It's a message about living a life of purpose and meaning and love. But it's more than that, still. Conduit is a poetic manual for understanding all the loses and confusing moments of this earthly existence, and seeing them in the crystal clear light of the Afterlife." "How does one cope with death of a loved one, especially that of a child? Jonni Gray chronicles the life and loss of her beloved son, with heart, insight, and hope. Conduit is a book for all of us. Her story is so intimate and profound. It will change your perspective of life, death, love, and loss." "This book is the story of an incredibly strong connection between a mother, Jonni, and her only son, Connor - a connection that both knew went back to many previous lives. From the time Connor was born he was seen as an "old soul" with wisdom beyond his years. Jonni’s work as a past life regressionist and her spiritual channelling gave them both deep insights into the nature of reality. When Connor was killed at the age of 22, Jonni was initially heartbroken and even contemplated suicide as many bereaved parents do. In retrospect, she could see that there had been unmistakeable signs that Connor's time in the physical was coming to an end and that on an unconscious level both of them knew how his exit would occur. With the aid of her spiritual guidance and the messages she received from Connor, Jonni was eventually able to understand that he had not left her - he was in fact hundreds of times more powerful and joyful in his expanded form which she playfully calls Connor 2.0. Conduit is a powerful story that calls us to see the big picture - that life and love are eternal and that our loved ones are always only a breath away. This is an amazing book on so many levels that will stay with you and expand your sense of reality." “One of the most important contributions that anyone can make is to help us expand the boundaries of consciousness and our reality. In her honest, heartfelt, and bittersweet book, Dr. Gray has not only helped expand the bandwidth of the deepest meaning of love, but has courageously extended the application of love and connection into the transpersonal realm of our beingness. “For bereaved individuals who are ready to look at the grief experience through a new lens, Conduit is the perfect place to start. “Past life repressionist Jonni Gray writes with heartfelt honesty about the powerful soul connection she felt with her only son, Connor, before, during, and after his death. The idea of outliving one’s child borders on unthinkable, yet many parents face such shocking realities. 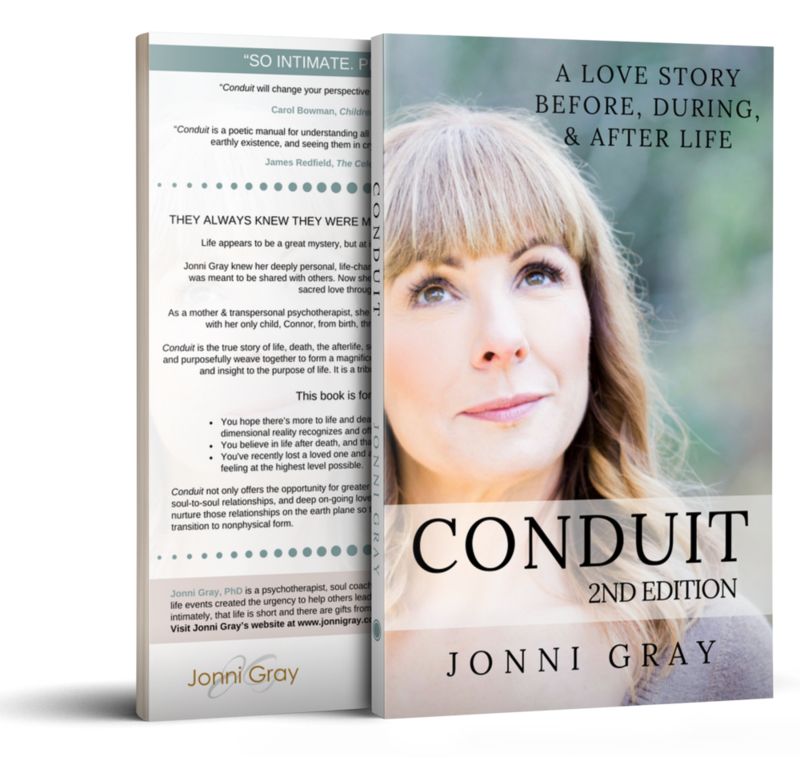 What I loved most about Conduit, is how Jonni’s ability to tune in to energetic conscious vibrations and sense and feel the signature and essence of her son, provides her with remarkable insights that transform her view of love, relationships, and life purpose. Through tuning into and channelling answers from spirit, Jonni recognizes the tremendous significance Connor had in her life, and the many ways his spirit has accompanied her through every stage of her life. There is a way to view the significance of anyone’s life far beyond the mere physicality of it, and this way invites us to see ourselves as much more than physical selves with human names and ageing bodies. From such a spiritual vantage point, love is eternal, and connections of love provide us with all sense of meaning, love, and purpose in our lives. As Jonni describes how Connor’s transition from life into expansive being-ness was so painful for her human self to feel, she also describes the immeasurable joy of knowing for sure that her love with Connor is ever-present and eternal. From this viewpoint, Connor can still be felt as an encouraging, loving presence, and in that very real sense, he is still here. I cried tears of expansive love by the time I read the last few pages of this book.